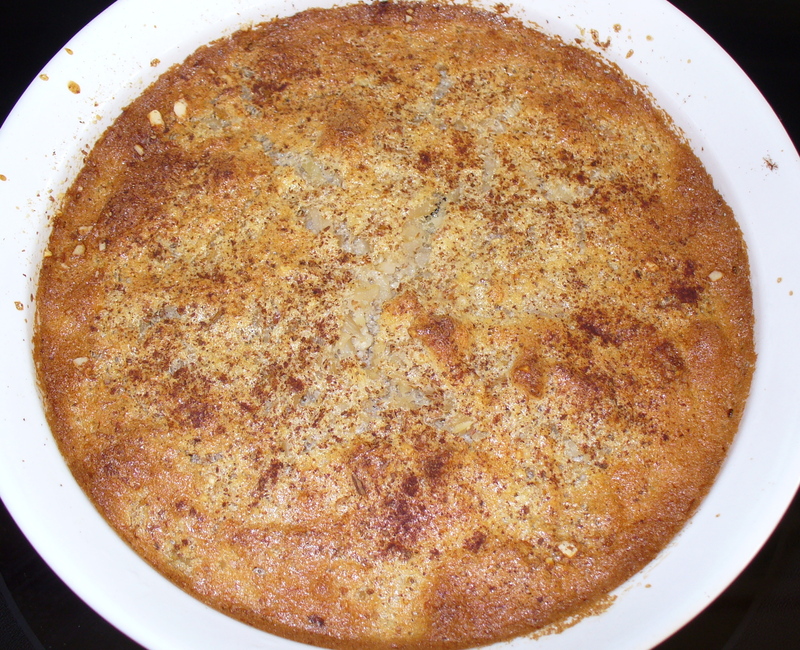 Baked rice pudding seemed just right on a chilly, rainy November morning. Besides, I was pondering the virtue of meekness; and the two complement each other in essence and substance. What does that have to do with rice pudding, you may ask? Well, rice pudding embodies the qualities of meekness if one considers that rice, as a grain food-source, is second only to wheat, much as meekness is secondary only to humility. Rice checks the impulse of pungent, spicy sauces and mellows other foods served with it. Rice also bears well with other ingredients, fortifying and enabling what would otherwise fail or be lacking as single ingredients. And, rice is a swamp grass of which the grain is utilized in itself, not needing to be ground in order to offer its tremendous nutrient value, adding its gentle and bland flavor which offends no palate. Like meekness, rice is not weak in substance but enhances the diet, brings peace and a certain calm to the system, strengthens the body and is enjoyed by anyone as it is the staple diet of half the world’s population. It is, in fact, an affable grain, with ample water being necessary for its growth; meekness, too, requires the regeneration of innocence and clarity to the soul such as cleansing water used in cooking rice. Yes, we can learn much about meekness while preparing rice pudding. It will be a part of the daily hermit diet for a week or so. The following recipe provides 6-8 healthy servings. Cook 1 1/2 c. rice in 2 1/4 c. boiling water. beat egg yolks, sugar (or jelly and honey), and vanillia in large bowl. Stir in cooked rice, cooled or warm. Add milk, juice, raisins or chopped dried fruit of choice, and nuts (or sprinkle nuts on top before baking). Whip egg whites until stiff and dry; fold into rice mixture. Turn into greased baking dish. Sprinkle with spice/s. Bake for 45 minutes in 350° oven or until set and firm in center. Serves 6-8. Note: I emptied a partial jar of quince jelly rather than use sugar but added honey, to taste. I enjoy Rice drink, not lactose milk, plus used juice because I had some to use up. Try whatever spices and nuts that sound good and are at hand. 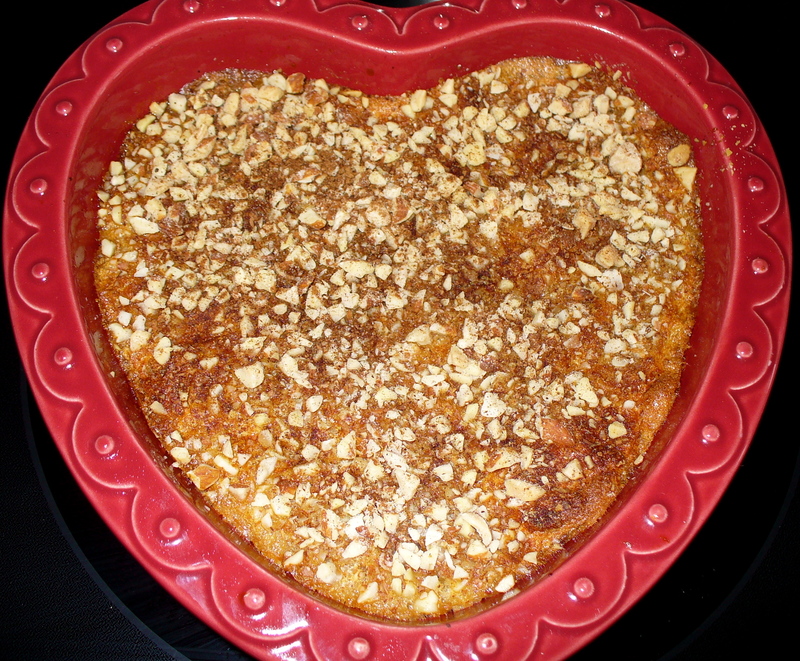 This recipe filled two approximately 8-inch ceramic baking dishes (round, heart-shaped, in photo). 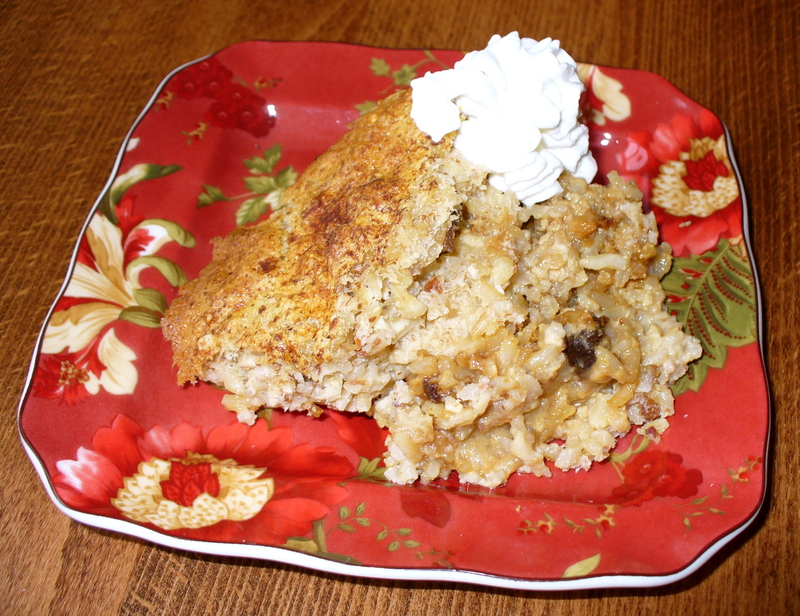 Ingest some nice Meekness Rice Pudding! * Tanquerey, Msgr. Adolphe A. The Spiritual Life: A treatise on ascetical and mystical theology. 1930. Belgium: Desclée & Company, pp. 545-47. This entry was posted in Living Holy, Recipes. Bookmark the permalink.